The Morongo Casino and Resort in Cabazon, Calif. It was put on the California Labor Federation's Do-Not-Patronize List after failing to bargain in good faith with Diamond Bar, Calif., Local 47. Congress is close to passing the largest retreat on labor rights since the implementation of the National Labor Relations Act in 1935, and several wavering Senate Democrats will cast critical votes deciding whether the anti-worker effort succeeds or fails. At issue is the Republican-sponsored Tribal Sovereignty Act, which passed the House this month. The bill would exempt any business or corporation partially or wholly owned by a Native American tribe from the National Labor Relations Act, which guarantees workers the right to join a union. If the bill passes, an estimated 600,000-800,000 Americans would lose their rights to union representation. President Trump is expected to quickly sign it if it reaches his desk. As with most legislation that harms working families – “right-to-work”, for example – the act’s popular name is misleading. The IBEW and other unions respect the federally-protected sovereignty that Native American tribes have when it comes to their own governmental issues. But this bill has little to do with that. Many of the workers who would be affected are employed in businesses that have nothing to do with tribal concerns. It’s not just the construction and operation of Native American-owned casinos where workers would be stripped of their voice on the job. Tribes also have interests in lodging, retail and the financial services industry. IBEW members have seen first-hand the proposed law’s potential impact. Several years ago, Diamond Bar, Calif., Local 47 earned the right to represent about 30 slot-machine technicians at the Morongo Casino and Resort, which is located in in Cabazon, Calif., and owned by the Morongo Band of Mission Indians. Business Manager Patrick Lavin said a contract agreement was reached after 16 months of negotiations and approved by the local union. But negotiators for the tribe – which included members of the tribal council – declined to recommend passage when they took the contract to the tribal members for approval, even though they’d negotiated the agreement themselves. Lavin said he had not seen such a scenario in more than 50 years of IBEW membership. The tribal members voted “no” and the parties have reached a stalemate. The tribe was empowered to take such an action by the pending legislation in Congress, said Lavin, who is also a member of the International Executive Council. 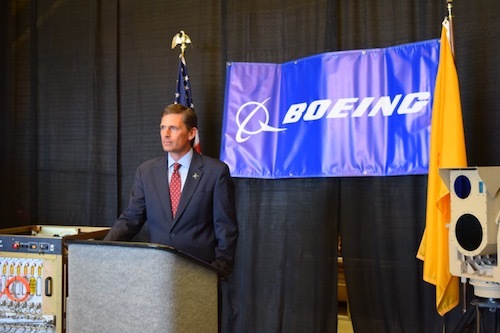 New Mexico Sen. Martin Heinrich speaking at Boeing’s facility in Albuquerque in Aug. 2017. Heinrich is one of several moderate Democrats facing pressure to vote for the Tribal Sovereignty Act, an attack on workers’ federally protected rights to join a union. Photo provided by U.S. Senator Martin Henrich. The California Labor Federation put the casino on its Do-Not-Patronize List. Local 47 directly spent $1.5 million on conferences held at the casino and resort during the previous five years, Lavin said. That figure does not include money spent by attendees on gaming and restaurants. Local 47 helped other organizations set up conferences at the resort during that period, generating between $2.5 million and $3 million, he said. In the House, the Jan. 10 vote was 239-173, with 23 Democrats voting for the bill and 15 Republicans against. Republicans have a narrow 51-49 advantage in the Senate, and the bill needs 60 votes to pass. That means red-state and moderate Democrats are being pressured heavily by anti-union special interests to abandon working people and support the stripping of their labor rights. North Dakota’s Heidi Heitkamp, Montana’s Jon Tester and New Mexico’s Martin Heinrich are from states with large Native American populations, many of whom are mounting coordinated efforts to sway their senators alongside anti-union groups. All three are up for re-election this year. Virginia senators Tim Kaine and Mark Warner, who traditionally have been strong advocates for working families, are also key targets for the anti-union crowd, along with Wisconsin’s Tammy Baldwin, Arizona’s Tom Udall and Maine’s Angus King. Minnesota’s Amy Klobuchar and Tina Smith, Maryland’s Ben Cardin, Florida’s Bill Nelson, Colorado’s Michael Bennet and Alabama’s Doug Jones are also up for grabs, according to legislative experts. Senate Majority Leader Mitch McConnell is expected to call for a vote when he’s assured of getting the 60 needed. These members are hearing from tribal and gaming interests. They need to hear from the IBEW and other unions about how important this issue is. Members are asked to call their senator’s office individually or call (202) 334-3121 and asked to be connected to a senator’s office and urge them to vote “no”.